Formchange is the newest expression of Drive Forms, after the latter was deemed unsafe for use by various types of people. Drive Forms were the ability to split one's own heart and recreate it to a specific aim, in the form of Valor (for physical attacks), Wisdom (for magical prowess), or Master (for general improvements). But this narrow interpretation of the way hearts work, could lead potentially to the heart remaining broken and as such the creation of Heartless Keyblade users known as 'Darklings'. To prevent this eventuality Formchange was created, which is conceptually a bit like Style Change but instead of it being influenced by magic or attack commands, it is influenced by the bond between a Keyblade user and their Keyblades. This allows for distinct changes in form of the Keyblade as a weapon and grants the user a new ability or ultimate attack which they can only access if they are in agreement with the nature of their Keyblade. In its simplest terms it can be thought of as the showing of a bond between a Keyblade and its Keyblade Wielder. This form of bond expression can change all aspects of the Keyblade, its form, the color of the user's clothing and even the shotlock or style changes used by the Keyblade Wielder. These kinds of transformations have been classified in seven varieties, which occur based on the kind of Keyblade one is currently using. A form accessable by those who use 'Physical Keyblades' these are Keyblades which have no elemental affinity and no obvious show of magic. They are considered by those who have them to be the outright expression of their physical selves. In these forms, the Keyblades themselves do not change, but the kinds of commands and attacks used by the Keyblade user, become the ulimate form of those they are capable of with their weapon. They also give the greatest potential finishers to their Keyblade Wielder. If the user has either a slight magical leaning or a speed leaning the given finisher applied to this moveset changes. A form accessible to Keyblades with ingrained magical abilities. Elemental Forms' Keyblades become weapon that focus on unleashing ranged or magical attacks. It gives the user a Dark Blue color pattern on their outfits complete with as star theme. It is considered the stronger alternative to 'Wisdom Form'. A form change accessible to those whose Keyblades are considered 'Defensive' in some way. They give their users a change in clothing which makes them yellow with diamond patterns, and have changes in weaponry and movesets whichincrease the defensive capabilities of their users. Guardian form can also be used potentially to break the defenses of others by use of large weapons like hammers. A form change accessible by those whose Keyblades are deemed 'Offensive' in nature. This transformation gives the user a deep red clothing change with a camouflage-like pattern to it. It focuses on dealing damage both to individual targets and to large groups. This form is noted as changing the nature of the offensive magic (Fire, Blizzard, Thunder, and Aero) spells cast by the users, making them all close-ranged radial bursts that damage surrounding enemies. It is considered the better alternative to 'Valor Form' as it doesn't require one to lose magical ability to gain offensive output. A form which changes the users clothes to green with indigo colored flame patterns. This form is granted by 'Speed' type Keyblades and grants their users forms which focus on speed both offensively and defensively. The forms of weapons this kind of Keyblade can offer vary greatly but always focus on the ability to do things with the utmost amount of speed possible. 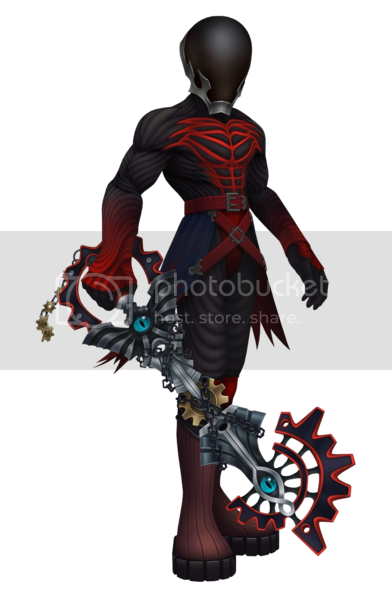 A form triggerable by any Keyblade which doesn't change the form of the Keyblade itself. 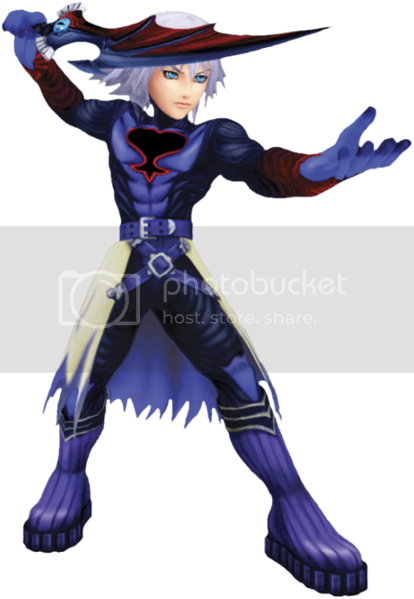 Instead it cloaks the user in darkness changing their eyes to yellow with a red glow and giving their clothing a grey and dark blue/black hue. In this form users attack in a more fast paced manner using their Keyblade and the slick shadowy movements to attack repeatedly. It is said to draw on the hearts true negative emotions and as such doesn't relinquish control of the Keyblade. This form comes with a special ability called Riskcharge. Riskcharge: A special ability granted to all while using this form which allows you to sacrifice half of your remaining health to power your own abilities up further. It can be used up to three times and is noted as being used by a pink wisp following the user. This will eventually lead to a wild attack which creates multiple dark spheres around the user that burst and deal heavy damage to all surrounding enemies before causing the user to revert into their normal form.